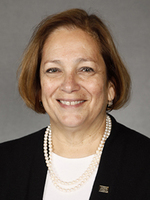 RNSA President Valerie P. Jackson, MD will honor the 100th German Radiology Congress with her presence. As part of the session "Self-Management for young radiologists", she will be reporting about "The Value of the Right Side of the Brain in Leadership". Valerie P. Jackson, MD, from Tucson, Arizona, is president of the Radiological Society of North America (RSNA). An expert in the field of breast imaging, Dr. Jackson is the executive director of the American Board of Radiology (ABR), a position she has held since 2014. She previously served on ABR’s board of trustees from 2001 to 2010. Dr. Jackson received her medical degree in 1978 from the Indiana University School of Medicine, and completed her residency at the Indiana University Medical Center in 1982. Dr. Jackson is the Eugene C. Klatte Professor Emeritus and has had numerous academic appointments at Indiana University School of Medicine over the years, including lecturer, professor and chair of the Department of Radiology and Imaging Sciences. The recipient of numerous honors throughout her career, Dr. Jackson is a fellow of the ACR and has received the gold medals of the IRS, SBI and ACR. The Valerie P. Jackson Education Fellowship also recognizes her work with ACR. Dr. Jackson delivered the Annual Oration in Diagnostic Radiology, “Screening Mammography: Controversies and Headlines,” at RSNA 2002.